The JCI Ireland Award Ceremony took place in the wonderful surroundings of the Grain Store, Ballymaloe House, Cork on Saturday 11th June 2011. The Outstanding Young Person of the Year (TOYP) is one of the most important programmes in the Junior Chamber International (JCI) calendar. The Awards were sponsored by Deloitte and honour outstanding young people who have excelled in their chosen field of expertise, endeavors and commitment to their communities. JCI encourages them to seek further advancement in personal achievements as well as public service. 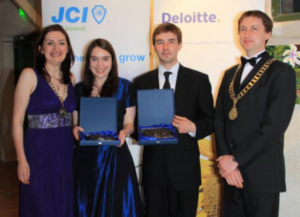 CEO Dr. Lisa O’Donoghue received the JCI Ireland TOYP Award this year in Science and Technology in June 2011 for her frontier research in recycling technology.